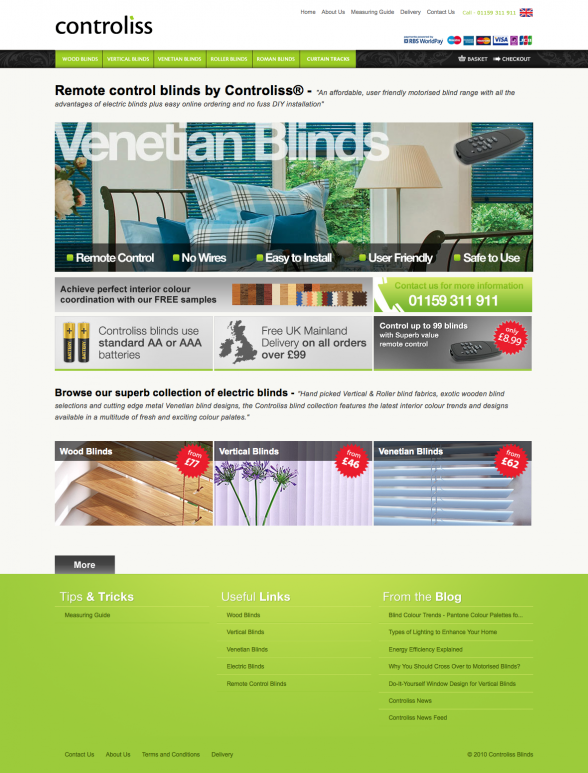 Juno have been web designing once more for Controliss the UK electric blind company. Controliss have now brought our their 4th range of remote controlled blinds; this time they are offering a wide range of stylish roller blinds. 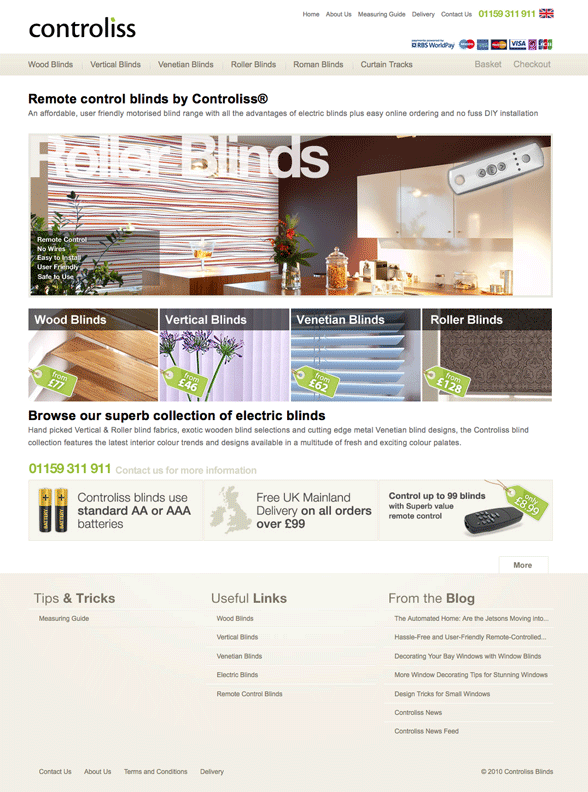 The website has been massively successful with site visitors spending many minutes on average looking at the wide range of automatic blinds. Real Web SEO have brought Controliss up the search engine results for many of their key terms and hopefully news will spread about this unique and safe innovation. This old design was created by Juno a couple of months previously, it was designed to get a clear message across about the free delivery, AA battery operated blinds and the stylish remote. 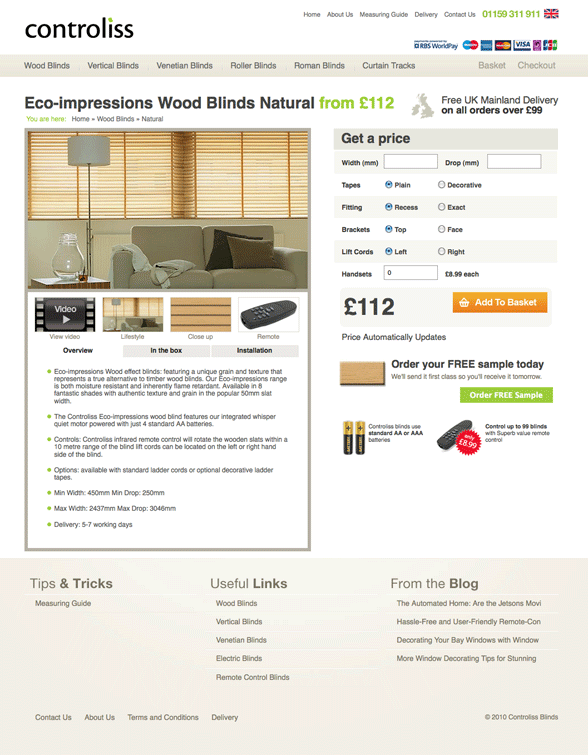 It also promoted the fact that a potential customer could get a free sample of blind material and tried to guide customers to specific styles of blinds (venetian, wooden and vertical) through 3 large category images. This design incorporated the original green/black theme which was on the first version of Controliss and a lot of green was used in the footer. After a while we felt that the visitor saw a mish-mash of styles and information about the blinds and many of the informative images weren’t click-able. The bright green made the top navigation hard to use as it used similar contrasting white text, also the same green dominated the footer. With the blind sample preview images the page had a rainbow of colours with the red “From £x” leaping out of the page. The new cream style give a sense of calm across the website and establishes Controliss as a luxury product instead of a novelty one we believe. The 4 categories, including the new roller blinds, are in a more prominent location so visitors can quickly find the products they are looking for. Below the categories main selling points of Controliss are visualised and explained as they are in the old design. Everything has been simplified on the new product pages and visitors can easy order a free sample. There is masses of unique content, video footage, multiple images of the product and targeted URL’s with the use of Magento. Again advantages of choosing Controliss blinds are shown just below the buy button for people who may be hesitant at the last step. Sales and search engine position have turned Controliss into a very exciting brand and Juno are now working very closely with the client to ensure continued success and development UK wide.